Haman was a prideful man. He did not tolerate losing the battle of the bride to Mordecai because in his mind it meant he was losing power. Haman created a scenario worthy of the king’s attention in an attempt to sway his opinion of the Jews and took it to the inhumane extreme of extermination. By ordering the pur, King Ahasuerus adds his name to the list of attempted assassins of the Jews. In today’s study let’s peek into the examination of conscious in regards to the same situation, the laws of the king. for three characters: Haman, King Ahasuerus, and Mordecai. 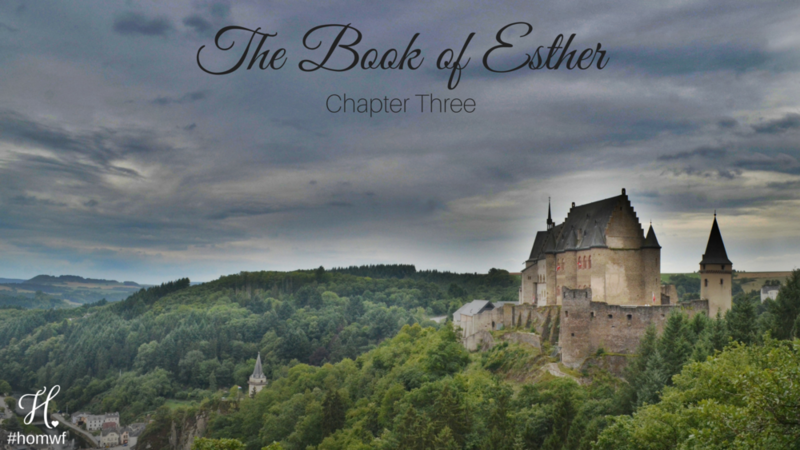 Our heroine, Esther, represents God’s will, however we have to wait until tomorrow’s study to further discuss her. King Ahasuerus entrusted few advisors to relay information between himself and his jurisdictions. And as king, Ahasuerus was privy to certain honors reserved for royalty: i.e. people were expected to kneel in front of him and his advisors. Think of your small inner circle…if one of those forcefully told you of the harm another was doing, would you be inclined to believe it? At a time before Jesus introduced a kinder more forgiving God, the Persians, as well as most societies, were inclined to meet any rebellion with force, and King Ahasuerus was informed by his most inner circle that the Jewish people were rebelling. Without Esther stepping in and educating the ill-informed Ahasuerus, one could arguably say he was not in the wrong…again good intention, bad judgement. This leads us to Mordecai, his rebellion of the laws of the land and adherence to the laws of God. Jesus taught us to give Caesar his due, however, again, Esther is before that time. As a Christian, I think if push came to shove, I would side with my faith over society and I think that therein lies some of the purpose to the story of Esther. Mordecai was breaking the civil law, but in the boundaries of his examination of conscience, he was following the laws of his religion. By Mordecai not kneeling to the government, Ahasuerus was willing to exterminate an entire race and society. Reflect: Think about a current situation in your life in which you bounce between what society expects and what the Church teaches. Is it possible to keep a separation of church and state in our day to day lives? What ways do you side with society over what Church dogma states? Act: Go to confession this week. We constantly put ourselves before God’s will and by going to confession this week we can move one step closer to sainthood, or at least have a holiday such as Purim follow our good deeds.